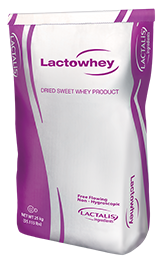 Low protein whey powder with a protein range between 6-10% protein. Hybrid between whey powder (12% protein) & whey permeate (4.5% protein): a smooth approach to optimize your overall costs. Whey product reserved for the US & Mexican market. Searching for an alternative to whey?